Ah, sequels. Where some overlap, along with a tiny bit of recap, are par for the course. So, I hit a milestone with a project yesterday (Tuesday). I’ve been noodling with a graphic novel script, a serious piece actually, for about ten years now. And a year-and-a-half ago I finally got it to a point where I was pleased with it. I mean, from the start it had some REALY strong material, but there were problems I just couldn’t quite fix. And then I DID fix them. WELL, the next step was to thumbnail a version of it, and as of Tuesday, that’s finally done! Mind you, it didn’t TAKE that long, I’ve just been busy with other things, and this is sort-of my project of love, which means that too often it gets pushed to the back burner. I don’t expect it done for another few years at least. But wow, to be able to read a rough thumbnailed version of it is VERY exciting for me. And to celebrate I made myself a dutch pancake. Yum! Things will really get interesting when Potty-bot is introduced. Aw, family gathering. Even diaper-bot is there. This is great. Also, Nogg’s eye in panel 11. Serious graphic novel? ‘Serious’ meaning it’s not funny, then, because all of your work that I’ve seen and purchased over the years has been seriously quality. Yaaayy!! Gang’s all here! Except for Dustin. And Martina. I really want Dustin and Bikkie to meet. 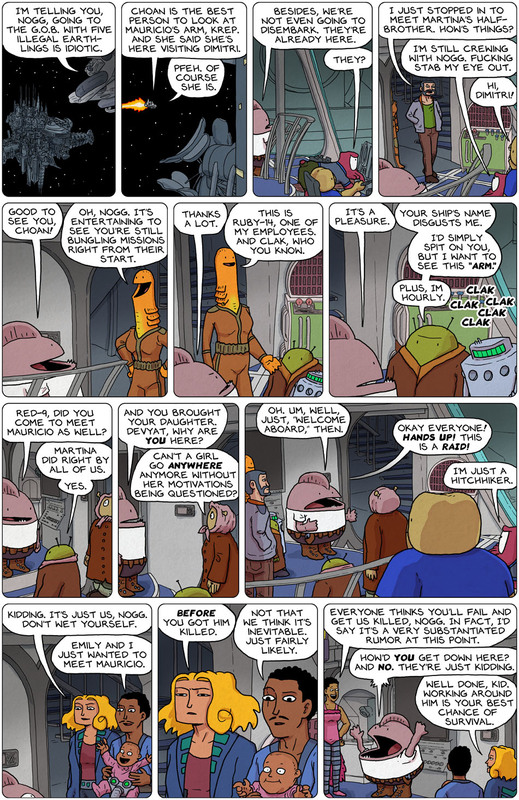 Hmm, I now have a hypothesis about the remaining unknown crew member…. Yeah, but is she going to have Dimitri’s blessing, or just stick it to him? Dibs on M.A.’s dutch pancake! Whooot! 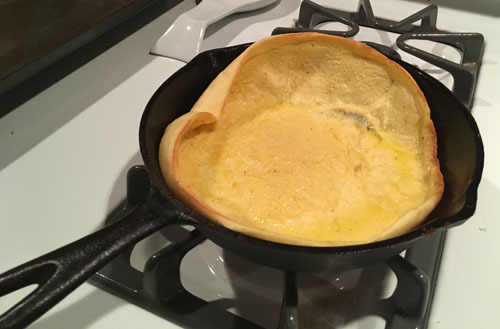 Actually, that looks something like what my family called “a baked pancake”, something I was able to offer at parties for many years. There are a couple of different names, and depending on the amount of flour you add, you get a thin crepe-like pancake or a thicker pancake suitable for cutting into squares and freezing. We always did the crepe and in addition to butter and syrup, we’d offer it with various preserves, jams, and jellies as a dessert — I *highly* recommend using lingonberries. I kinda feel sorry for Mauricio (well, even more sorry than I felt for him being grafted to a killer arm and knowing he is going to end up dead). After thinking of himself as so alone in the world, he finds out 1) he has a half-sister; 2) who was an incredible and much-loved person; and 3) dead…so he’ll never get to meet her himself. I guess I’m the odd one out. I feel bad for Nogg. He may not /be/ part of the ideal team for handling the disasters, but he goes out, finds them, puts them in a ship and actually initializes the day saving, and gets continual crap for it. Sure, it’s funny from outside the narrative, but it’s still a bit sad.